Much has changed, much is the same. 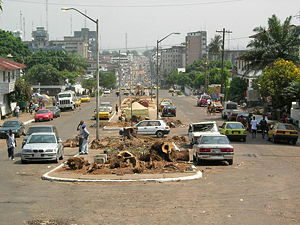 This is my major observation when revisiting Monrovia, after 32 years. I left in the wake of the 1980 coup of master-sergeant Samuel Doe, I left a country where hope had received an enormous impetus with the ousting of the TWP oligarchy and the installation of the country’s first government led by tribal people, hitherto excluded from power and the fruits of economic growth. I came back in a country ruined by a savage tribal war in which a quarter of a million people perished, the country’s infrastructure was devastated and a tropical gangster-president had turned the oldest African republic into a rogue state. After his departure in 2003, the country was even more divided than ever in its history. In the second half of the 20th century Liberia’s top priorities could be summarized as being national unification and economic development. Anno 2012, the country’s top priorities are reconciliation & unification, peace & political stability, and reconstruction & economic development. Unfortunately, my short visit was limited to the nation’s capital though this had no negative impact on my excitement. While in Monrovia I met with a number of interesting people including high ranking officials of President Sirleaf’s Unity Party, former advisors and collaborators of former warlord and president Charles Taylor, academicians, a banker, representatives of official donor agencies and non-governmental organizations, returned refugees and one independent journalist – who according to an insider is ‘the only Liberian journalist who is not for sale’ but I hope he was exaggerating. I also briefly spoke with two cabinet ministers. The conversations combined with my impressions while touring the city and its subsurbs inspired me to a number of reflections. On April 26, only a few days before my arrival at Robertsfield International Airport, the Special Court for Sierra Leone announced the conviction of former president Charles Taylor. It is important to note that he was convicted of crimes related to the civil war in Sierra Leone (1991-2002) and not for his role in Liberia’s civil wars (1989-1996 and 1999-2003). Up till now the only person convicted for crimes committed during the civil wars in Liberia is his son Chuck who was sentenced to 97 years by a US court. Former warlords walk free in Monrovia, the latest to join his former ennemies was LPC militia leader George Boley, expulsed from the USA. Former INPFL warlord who tortured President Doe to death Prince Johnson is a Senator for Nimba County, former ULIMO leader Alhaji Kromah was recently made Ambassador-at-large by President Sirleaf. She also appointed several former cabinet ministers in the Taylor Administration to important, and well paid, positions. One of them is LeRoy Urey, Deputy Minister for Administration and Public Safety and a former Deputy Attorney General under Charles Taylor and one of his associates in arms trafficking according to an official 2001 UN report. LeRoy Urey was made Chairman of Liberia’s Human Rights Commission (INCHRL). The Commission is, among other tasks, responsible for overseeing and following up on the recommendations of the Truth and Reconciliation Committee (TRC) but, as we know, the final report was shelved after publication in 2009. Human rights Chair LeRoy Urey also remained silent after the conviction of his former boss, Charles Taylor, which sharply contrasts with the tsunami of international reactions after the historic verdict of the Special Court for Sierra Leone. Also the Minister of Interior, Blamoh Nelson, is a Taylor associate. His working relationship with Taylor goes back to the early 1980s when the two headed the General Services Agency (GSA) in the Doe Administration. Later he served as Chief of Cabinet in the Taylor Administration. 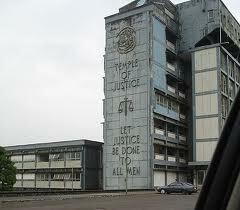 One of the Supreme Court’s Associate Justices is a former LURD rebel leader, Kabineh Ja’neh. It is interesting to note that in 2011 the Supreme Court ruled that some recommendations made by the TRC were unconstitutional, in particular the 30 year ban from politics imposed on President Sirleaf and a number of politicians and individuals . Charles Taylor still has many sympathizers and followers in Liberia, often former allies, collaborators and associates, and they seem to make more noise than the war victims whose number easily could reach half a million people. Early May it was announced that fifteen civil society organizations united to campaign for Charles Taylor’s release, saying that his conviction is a miscarriage of justice. So me people hold President Sirleaf personally responsible for shelving the final report of the Truth and Reconcilation Committee recommending the prosecution of all former warlords. They qualify her policy as ‘reconciliation without justice’. The United Nations Mission In Liberia, UNMIL, is crucial for maintaining peace in the country, the Armed Forces of Liberia (AFL) being weak and the National Police Force (NPF) unreliable as was demonstrated in late 2011. 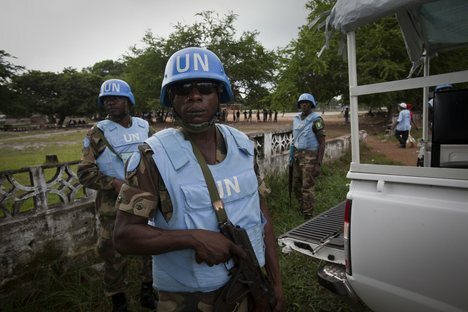 The UN military force is omnipresent in the capital where UNMIL’s headquarters are located adjacent to the Ministry of Foreign Affairs, where President Sirleaf holds office. At strategic points in the capital heavily armed UN military personnel assures peace and hence political stability. However, the UN recently announced it will reduce UNMIL’s size from 16,000 to 8,000 whereas it will be further reduced in size to some 3,750 soldiers in 2015. President Sirleaf’s second term will end in 2018. Born in 1938, she will then be a 80-year old ‘Iron Lady’. Hence, the question of her succession arises. There are indications that within her political party, the Unity Party (UP), ambitious politicians are already preparing for the foreseeable change. One of them is Varney Sherman, UP’s current chairman after the merger of his party, the Liberian Action Party (LAP), with the UP in 2009. But he of course is not the only possible candidate to her succession. Notably the younger generation has a number of promising potential candidates, one of them being Kimmie Weeks, an acclaimed human rights activist. I devoted a post on this remarkable Liberian in 2009. President Sirleaf recently appointed him to chair the Board of Directors of the Liberia Water and Sewer Corporation (LWSC). Though Kimmie Weeks has not (yet) indicated political aspirations, we are still far from the next presidential elections campaign (2017) and things may change rapidly. By the way, his background may be a serious disadvantage. Kimmie Weeks is the son of Rocheforte Weeks, former UL President during the Tubman Administration and former minister of Foreign Affairs under president Tolbert. Undoubtedly, the divide between the Americo-Liberians and so-called Congo people on the one hand and the tribal population on the other – far from being a homogeneous bloc as the civil war has demonstrated – still exists. As long as this divide exists the peaceful future and political stability of the country are uncertain. Among Liberians there are growing concerns that President Sirleaf is more concerned about her international reputation than this internal problem and potential conflict, official declarations such as on the occasion of May 14, National Unification Day, notwithstanding. Rising accusations of favoritism and nepotism – some critics even compare her with former Presidents Barclay, Tubman and Tolbert – further feed a growing dissatisfaction with her internal policies. Unfortunately, my agenda did not permit me to travel outside of Monrovia but what I saw in the capital was impressive even though much remains to be done, notably in the interior as I was told. Roads are being rehabilitated, often with foreign – notably Chinese – funds, and plans are well underway to rehabilitate and expand the Mount Coffee hydro-electric plant in White Plains. The plant was looted and destroyed during the civil war. Almost ten years after the second civil war electricity in the capital is still mainly provided by private generators and only affordable by a few. What impressed me most are developments in the area of education. Early May 55,000 high school students sat for their exams. Not less than 25,000 senior high school students from 380 high schools across the country and 30,000 junior high school students from 925 schools hope to pass the exam and thus secure a better future. Moreover, in the country’s 31 teriary institutions some 44,000 students are enrolled, more than half (24,000) at the University of Liberia. 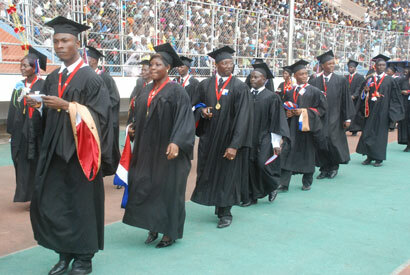 Nearly 2,500 students graduated for the academic year 2011/2012 at the University of Liberia. And today, on May 19, 25,000 candidates sat the UL entrance exams. It is expected that some 30 – 40 per cent will pass, adding another 8,000 university students to the existing numbers – only for the UL! These high numbers both show the importance attached to education by the Liberian population but also the effects of the civil war since during the conflict also educational facilities and activities came to a virtually standstill. Everybody wants to make up for the time lost. Of course, these high numbers don’t say anything about the quality of education, which leaves much to be desired since less than a third of secondary school teachers is qualified, even according to Liberian standards. To make things worse, where will the 55,000 high school students and 2,500 university graduates find employment? This brings me to my last point: economic development. In a country were an estimated 90 per cent of the population in the working age is unemployed, top priority should be given to labour-intensive economic activities. Only agriculture and agro-industrial activities may bring a solution. However, despite international objectives and commitments such as the 2003 Maputo Agreement to spend 10 per cent of the national budget on agriculture – adopted by the Government of Liberia – public expenditures for agriculture are very low. In Fiscal Year 2010 the Government of Liberia only spent US$ 4 million of its $ 400 million budget in the agricultural sector – half of it went to Monrovia-based civil servants – disregarding here the support of the international donor community. Like previous governments the Sirleaf Administration relies on foreign funds, both from public sources and from international investors. Among the president’s greatest achievements are the cancellation of the nation’s US $ 4.6 billion debt and the nearly US $ 20 billion in commitments of foreign investors: for agricultural activities – notably oil palm plantations – iron ore mining and oil production. However, although President Sirleaf and her main advisors, among whom Amos Sawyer, the powerful Chairman of the Governance Commission, and Togba Nah Tipoteh, the influential Chairman of the Committee elaborating the visionary 2030 document, are well aware of the lessons of the past with respect to the Open Door Policy – the policy to attract foreign funds and know-how for the exploitations of the country’s rich natural resources in exchange for substantial privileges such as tax holidays a.s.o. – Liberia risks to repeat the mistakes of the Tubman and Tolbert Administrations. Foreign investors like Sime Darby are given large tracts of land for economic activities, disregarding the rights of Liberians who have been owning and working on these lands since centuries and who depend on these land for a living, read: for survival. Liberia risks to repeat ‘Growth without Development’, a phrase coined by a Northwestern University team studying President Tubman’s Open Door Policy in the 1960s – unless something is done about it since it is not too late. Crucial in a country’s development are politics, policies and politicians. Liberia’s 165 years of independence are a living proof of it. Nearly everybody I spoke to agreed that Ellen Johnson Sirleaf is the best person to guide the Liberian nation now: ‘Everybody else would be worse’ – and I agree with this statement. However, one of my sources seemed to be pretty sure saying: ‘History will not judge positively about her, President Ellen Johnson Sirleaf.’ If that’s true, only history can tell us. For the time being I will continue to closely follow events in Liberia. Last but not least: ritual killings, a phenomenon older than the Republic. Every Liberian is well aware that these revolting crimes continue to happen, including President Sirleaf. From three different sources I was told of the continuation of these repulsive practices. According to one source a case of ritual killing occurred in White Plains in March of this year. Another source informed me about a failed attempt to kidnap a person who thus escaped from a cruel death. This happened last year, ‘during the elections campaign’, according to my source of information. The third case concerned a case of ritual killing, in Todee District, Margibi County, involving a tribal chief. The case was dropped given the status of the accused. As I said in the beginning of this post: Much has changed, much is the same. This entry was posted in Africulture, Alhaji Kromah, Amos Sawyer, Barclay, Blamoh Nelson, Charles Taylor, Chuck Taylor, Civil War(s) Liberia, Debt relief, Ellen Johnson Sirleaf, Famous Liberians, George Boley, INPFL, Justice, Kimmie Weeks, LeRoye Urey, Liberia, Liberia Education, Liberian Demography, Liberian Economy, Liberian History, LPC, Monrovia, national budget, Prince Y. Johnson, Reconciliation, Ritual Killings, Samuel Kanyon Doe, Sierra Leone, Sierra Leone Special Court, Tipoteh, Truth and Reconciliation Committee (TRC), ULIMO, University of Liberia, UNMIL, Varney Sherman, William R. Tolbert Jr., William V.S. Tubman. Bookmark the permalink.